I feel like I am so on top of things, especially for a Monday! I was able to make this card yesterday and I *love* the way it turned out! This is for Karen Giron's Sweet Sunday Sketch Challenge #14. I also played around with my new Matchbox Bigz XL die for the Big Shot. I used a scrap piece of Always Artichoke cs and the die to cut the label for the sentiment. I stamped the frame with Chocolate Chip ink two times - once on Sage Shadow cs and once on Very Vanilla cs. I trimmed each so that they would layer on top of each other, and I added the sentiment to the Very Vanilla. 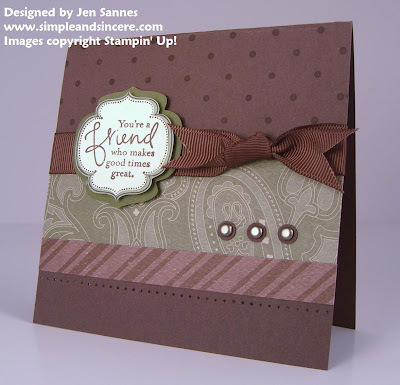 The frame and sentiment are from the Great Friend set, available in the Occasions Mini. Did you notice how I notched the ends of my ribbon? I love that little touch, it adds to the elegant feel of the card. It looks really neat and elegant! Love it! Love this DSP! Love the how you balanced it all. Is it a square size? Beautiful card. Love the colors and the way you put it together. Very elegant. I love it too! Especially the way you used the different patterns of patterned paper, very fun! I love the paper. It is so yummy! Very cool card - I love that DSP, masculine and beautiful all in the same boat! Love the rich colors. It makes me hungry for chocolate.